Mort Kunstler Handsigned and Numbered Limited Edition Print:"New World, The"
Size: Paper: 18" x 29"/ Overall Size: 23" x 33" / Canvas: 21" x 34"
Edition: Artist Signed and Numbered with COA. Medium: Limited Edition Print on Paper and Canvas Giclee. Mort Kunstler's Comments: This is a very special painting for me because it depicts the opening scene in the historical drama that established our nation. Years ago, I discussed this idea at length with Roxane Gilmore, who - as the wife of Governor James Gilmore - was Virginia's First Lady. She was also a professor of history at Randolph-Macon College and the chairperson of the Jamestown Commission. She had a deep interest in the landing at Jamestown and our discussion really kindled my motivation to paint this dramatic and crucially important historical event. I love painting the Civil War, and I hope to be doing it for years to come because I have so many more scenes I want to paint. But I do enjoy occasionally focusing on another era, and the 400th anniversary of Jamestown was simply irresistible. It all came together for me as an artist one morning when I stood on-site at Jamestown and studied the lighting at the time of the landing. I suddenly saw The New World, finished, in my own mind. Karen Rehm, the chief historian at Jamestown Historic Park, and Nancy Egloff, the historian of the Jamestown-Yorktown Foundation, were both exceedingly helpful during my research for this painting. So was Tom Davidson, the senior curator of the Jamestown-Yorktown Foundation, and Robert Jeffrey, the Foundation's communications specialist, who accompanied me during my on-site study of the three replica ships that made the voyage from England to Virginia. In the right foreground of the painting, one musketeer is blowing on the match to keep it lit. The other musketeer is resting his weapon on a musket rest because the matchlocks of the era were too heavy for most men to hold and fire. The flag flying just right of center in the picture is the English Union Jack, which was created in 1606 as a combination of two flags - England's Cross of St. George and Scotland's Cross of St. Andrew. The flag to the left is the Cross of St. George, which had been the national banner of England for centuries. 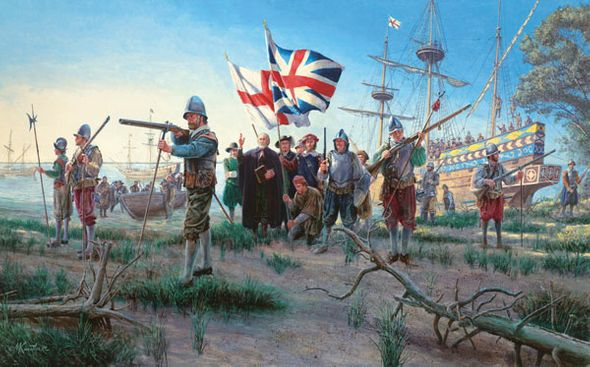 At the time of the landing at Jamestown, English ships continued to fly both flags. Like so many other Americans, my family has been blessed to live in this country - so it's a privilege to paint the tremendously important event depicted in The New World. No thank you, I just want the unframed SN Print.